Seyyed Abbas Araghchi, Iranian Deputy Minister for Foreign Affairs in charge of Legal and International Affairs, Mohammed Javad Zarif, Iranian Minister for Foreign Affairs, Catherine Ashton, High Representative of the Union for Foreign Affairs and Security Policy and Vice-President of the EC, Helga Maria Schmid, Deputy Secretary General of the European External Action Service (EEAS), and James Morrison, Head of cabinet of Catherine Ashton (from right to left). (EC Audiovisual Service, 20/11/2013). The fall of oil prices right after the European Union negotiators, working on behalf of the E3+3 group, reached an agreement with Iran, was the first and infallible sign that this was a step towards the right direction, at least for the energy importing countries. 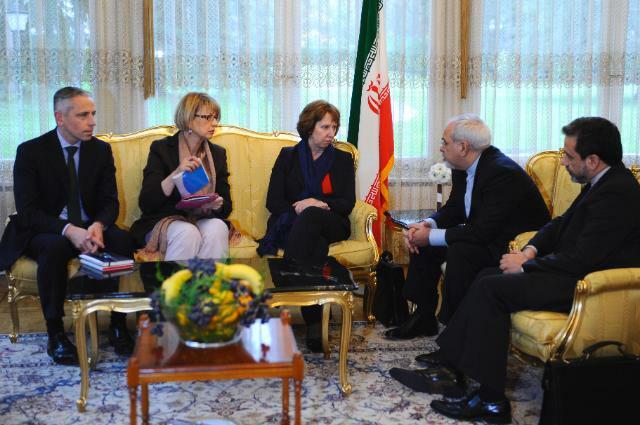 In the Geneva negotiations, the West was represented by Catherine Ashton, the High Representative/Vice-President of the European Commission, while the Iranian mission was headed by the country’s foreign minister, Mohammed Javad Zarif. This is an interim nuclear agreement of six month duration, reached between Iran and the E3+3 group, which comprises three EU countries (France, Britain and Germany) plus US, Russia and China. The main provision of the agreement obliges Iran to “halt enrichment of uranium at 5% purity”, while the E3+3 group will have to lift trade sanctions of up to $7 billion. In every respect this is a major breakthrough in world politics and is bound to change the strategic relations of key players in the Middle East. All interested sides will be forced to rearrange their foreign policy standing, despite the limited and rather vague content of this initial pact. Presumably the main agreement to follow within six months will have far-reaching repercussions. The European Union had a crucial role to play in this affair. The EU’s Foreign Service has been working during the last four years towards an agreement. The President of the European Commission José Manuel Barroso made a statement on Iran talks: “The agreement found in Geneva between the European Union, negotiating on behalf of the E3+3 countries, and Iran is a major breakthrough for global security and stability. I would like to congratulate in particular Catherine Ashton, the High Representative/Vice-President of the European Commission, for this accomplishment which is a result of her tireless engagement and dedication to the issue over the last 4 years”. A statement with similar content was issued by the President of the European Council Herman Van Rompuy:” This step shows the commitment and courage by all parties, including by Iran under newly elected President Rohani. I commend all for their efforts. And I commend EU High Representative Ashton for her crucial role – as negotiator on behalf of E3/EU+3 and cochair of the talks. Her dedication and perseverance have been key in brokering this first agreement”. In many respects this agreement was a much-needed development for the EU. For one thing the Union needed an external success story to counterbalance the failure of its “The Eastern Partnership” strategy, meant to extend its influence to Eastern Europe. However, Ukraine, the main target of this EU strategy, made a last-minute U-turn and refused to sign a Partnership Agreement with the Union, despite the fact that this road could lead to an application for full membership after some years. Instead, Kyiv run to Moscow and singed the Eurasian Union, a Russian sponsored trade and judiciary union. The European Union, as a huge importer of energy, mainly in the form of crude oil, has a lot to gain form the rapprochement with Iran, both in the short and the long run. Firstly, spot prices of oil fell and are expected to remain weak in the near future. Given that the EU imports most of its oil from the Middle East, a long-term arrangement strengthening peace initiatives in this tormented region, may have multiple positive effects on Europe. The EU as a major exporter of goods and services to the eastern Mediterranean and beyond has a lot to gain from the release of the growth potential of this region.